Check out Tobi's Yvonne Lace Crop Top A crop top that you can take to all your upscale events. The Yvonne Lace Wine Crop Top features gorgeous half sleeves, a plunging neckline, and a beautiful scallop hem. Pair this dressy top with its matching high waisted skirt for an evening look you'll want to put on repeat. A crop top that you can take to all your upscale events. The Yvonne Lace Wine Crop Top features gorgeous half sleeves, a plunging neckline, and a beautiful scallop hem. Pair this dressy top with its matching high waisted skirt for an evening look you'll want to put on repeat. A crop top that you can take to all your upscale events. 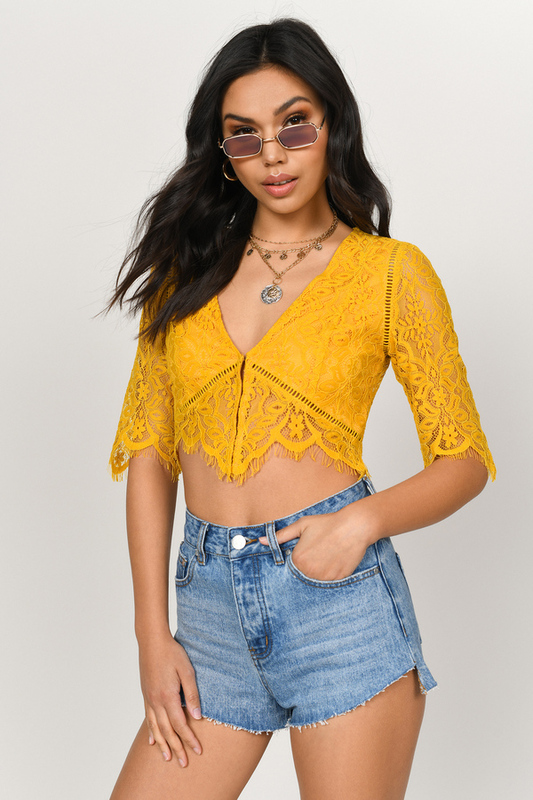 The Yvonne Lace Yellow Crop Top features gorgeous half sleeves, a plunging neckline, and a beautiful scallop hem. Pair this dressy top with its matching high waisted skirt for an evening look you'll want to put on repeat. Wine,Yellow modeled on a size Small.